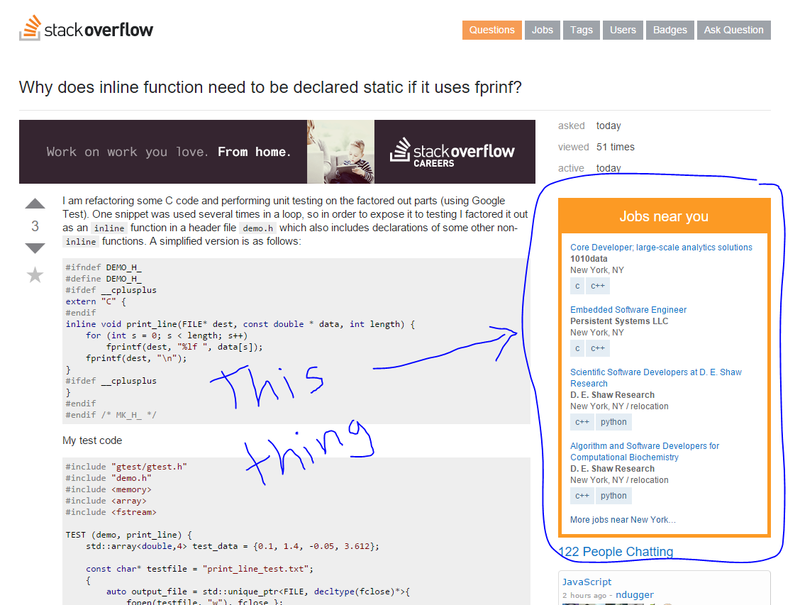 You know the little blue/orange/occasionally-other-colors box where we advertise Jobs on Stack Overflow? Aren't they beautiful? Don't you love their design? We love them like a mother would love her... neighbor's ugly child... and it sure has been fun hanging out with them, but perhaps it's time to go. The reality is, we've never spent much design time on these, and it shows. Not only could the aesthetics be improved, but we think there's potential to improve their utility by altering what information we present, and how we present it. So, with the recent change in sidebar size, we think it's finally time to give them some love. Well, not these ads, they're ugly, and love ain't gonna solve that, but we can get newer prettier ads and love them instead! We're just barely getting started with ideas internally, but we wanted to simultaneously open up the floor to ideas from the community, rather than waiting until we're done and asking for feedback. So now is your chance to tell us: What factors into your decision to click or not click on an ad? What kinds of information are most important to you? Do you have any anecdotes on how you select jobs to apply for? Besides individual job listings, are there other types of ads for the job board that you would find interesting? Other ideas or comments? We have to design for both 300x250px and 300x500px "creative" sizes. All of our basic ad rules will apply: nothing super obnoxious, no animated ads, no hover actions, etc. We're looking to design more than one replacement ad. We'll start with gut feelings, then A/B test various ideas to see which ones are effective. This isn't a design competition, though you are free to submit images if it helps you express your ideas. We might use them as inspiration. We're not looking for feedback on how we could give you more individual control over the ads you see, or to stop seeing job ads entirely if you're truly not interested. Honestly, we really want to do that, and it will happen, but for the moment, let's keep this on topic. A few basic ideas we're already throwing around. Feel free to comment or expand on them. Display a single job per ad, but with more information about the job/company, and perhaps images. Display a single job, but make the ad interactive where you could swipe through multiple listings. Create themed ads for specific geographies with lots of jobs, like New York and London. Creatives which don't advertise specific jobs, but instead advertise how many jobs we have in a particular tech stack in a particular location, perhaps highlighting how many were posted recently. What factors into your decision to click or not click on an ad? I like to see a salary range that is in a range I'm interested in. Since I work full time I don't really have time for ads that don't answer this basic question. The jobs page listing adds a lot more helpful features like Remote, offers VISA sponsorship, etc. Gonna throw an idea out that I'm not sure is a good one. Rather than highlight a single tag (and maybe display more than one tag, or include geo - assuming those are big contributors to why the ad was shown). Not sure if folks like those explanations though. This way you can help me not be distracted by ads that I will not be interested in at all. 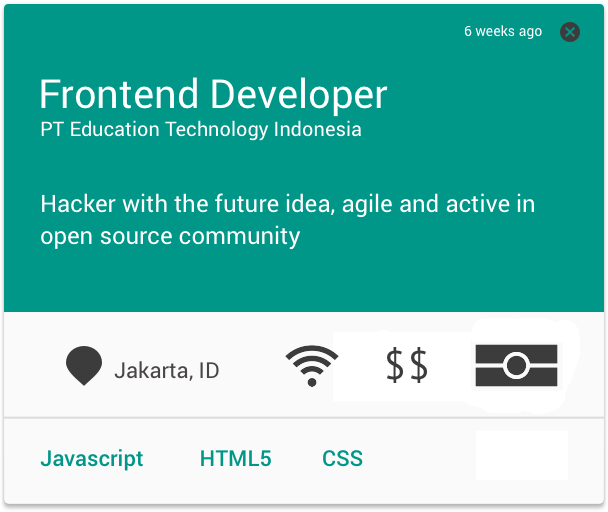 My concept is using material design job search ads, we can change the color if needed, this is just default template from me. Some ideas, some of them inspired by or taken from other answers, with a mockup of what I'm thinking. This probably helps that job get more attention, since you can bring in more information about it and still not overload the user (since you're only showing one lot of a lot of information, instead of three at once). The rest of these ideas are based on this assumption. There are informational icons all over Jobs, such as those that indicate visa sponsorship, remote and relocation options. Those could be included in the job ad. Give companies the option to submit a background image to go on their job ad; if they don't, you could default to using the company image. Sort of comes under informational icons, but I wanted to mention this specifically. Each job appears to have a busines sector associated with it (retail, tech etc): show this on the ad. The colours could use some work, and you'd probably want it in a sort of "here are jobs" section because otherwise it's not immediately obvious what it's advertising - but you get my point. That's what I'm thinking. I'd like to see the salary range directly in the ad. For me, it became a distinguishing factor about which kind of developer the company is looking for. 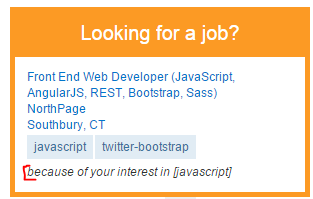 If it is in the low salary range for that area, I assume they want a programmer with not much experience or knowledge. Consequently, if it is in the high salary range for that area, I assume they are looking for more advanced developers. 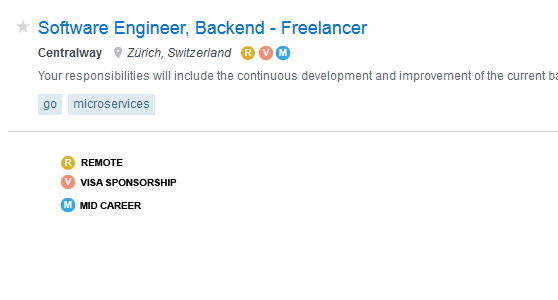 It would be interesting to display an approximate age for the job listing (either when it was posted or when it was last updated). Maybe this could be a whole ad unit ("New [whatever] jobs this week"), or maybe recent(ly updated) jobs could be called out visually within a normal ad. There's something appealing about getting your application in early rather than hoping that a job listing that hasn't been touched in more than 30 days is still open and applications are still being reviewed. i'm not sure is it possible or not but i think it should be rtl support with a better fonts ! Am I at work? No way am I going to go browsing job ads when I'm at work, unless they're for completely irrelevant jobs everyone knows I'm not interested in. Of course, when I use SO at work, I'm most likely looking at questions about technologies I'm stuck with now; at home, I'm more likely to be looking at questions about technologies I want to use. How true that is is probably correlated with how likely I am to be open to a new job in the first place. Is it for the job I already have? My company advertises on SO and I find this advert in particular very disturbing. It tries to sell me a job here, on the basis that I'll be working with great people such as me. What kinds of information are most important to you? The thing you are trying to replace is a market for lemons. If I click a job ad, I have a very small chance of actually getting a job out of it: not because I'm unhireable, but because the company is looking for someone entirely different from what they said, or they don't actually have budget to hire someone, or they are hiring in the US and not offering visa sponsorship, or any number of avoidable reasons. Giving me more confidence that the outcome will be either a job offer or a rejection would encourage me to take part. Other than that, I think the information on the current ads is about right: who the company is, what field the work is in, where they're hiring for. I would like to share my idea. As per my little experience i have little idea. You may add icons for job details. For example there will be a job detail page where you will add all icons you need along with their abbreviation. 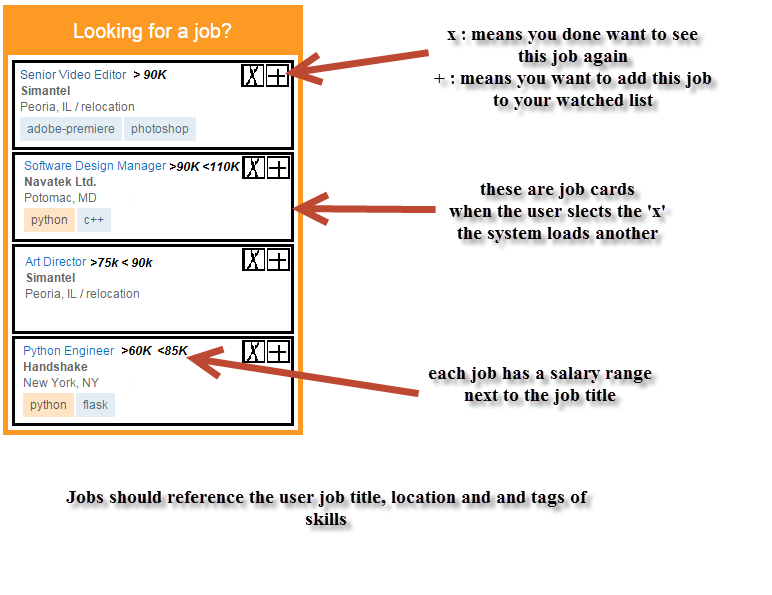 In the job ads you will have to just add icons which will indicates the job benefits and requirements. You can show more details of job in small place using icons, it will also helpful in responsive . I hope you understand what i want to say exactly, also i attached a test ads image. Right now I see, let say, Java, SQL. After I click it appears that the three other tags point to languages / technologies I'm not intimately familiar with. I believe there are three different color'd boxes. Orange, Blue and Yellow. Orange seems to show me two relatively local listings and two "somewhere else in the country" listings. Not all of them are relevant. For example, I keep getting this one. The location is somewhat close, but none of the tags are relevant (OK...I do think I know how to use logic, but I know nothing about design work or adobe products). The other one for the same company keeps appearing too. It has no tags, so I assume it is also targeting by location. Neither of these are relevant to my skill set. 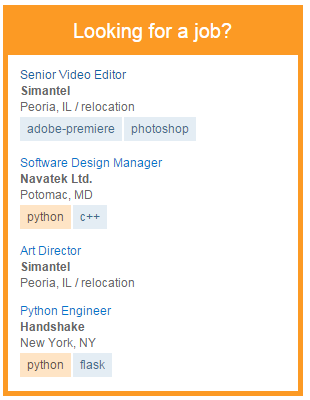 The other two positions have the python tag that I'm active in, but the one at Navatek has a c++ that I don't think I've ever answered a question in. Of the 4 listed above, the only one I'd even consider clicking is the Handshake job. But, it doesn't have a note about Relocation or Remote, so in this case, I wouldn't. These are the two jobs I mentioned above. 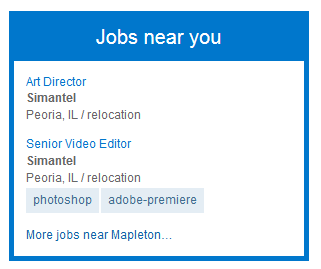 I'd never click on either of these jobs as displayed. I'm not qualified for either based only on the job title and tags. This one is targeted based on tag. 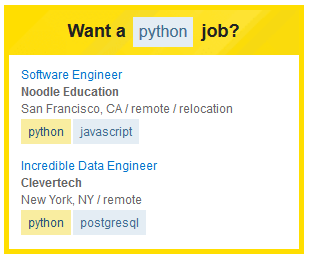 I don't know if a user can have more than one associated tag, but I only ever see jobs for Python. Makes sense, as that's where I spend a majority of my time. Both of these jobs have a tag I'm skilled in and offer remote work, which I've indicated in my CV. I'd look at both of these positions. However, once I have (and I have seen the Clevertech one a ton), I won't click it again. A way to indicate that a position isn't relevant or that I'm not interested would be helpful to me (and probably you). For me, it'd stop showing something I'm not interested in. For you, it'd give you feedback on the jobs that you could use to better target users, share with the employers, or at least use to make targeting toward single users more relevant. For me, if the position isn't near my physical location, it's important that I know if they offer relocation or remote options. That does mean that remote needs to actually mean "full time telecommute position" though. If it doesn't (and many that I seem drawn to don't) that indicator is noise. It's also important to know the company name, job title and tags. Salary range would be nice, but it's not on enough listings yet that it may bias me when I see four listings and only one has a salary range. Do you have any anecdotes on how you select jobs to apply for? I'd love to watch the "Matches" tab on Jobs. The jobs there seem to be fairly relevant. However, I find it unuseable. The matches aren't sort-able by post date and I am sick of seeing the "most relevant" job being something that was posted weeks ago. I have no way to clear that order and the most relevant job for me is not the top job. Just scrolling through the list now, I see multiple jobs that were posted in the last week that I didn't see before because they are so far down my list. Instead, I go to the most recent tab, select a few options (usually "remote") and look at the most recent matches that way. It's not optimal, especially because there are two other ways that look like they would be useful if issues were fixed, but that's how I use Jobs now. Besides individual job listings, are there other types of ads for the job board that you would find interesting? Personally, I wouldn't find the individual listings interesting. I get them occasionally, but all they do for me is scream "advertisement!" and I tune it out. The size of this ad is larger than the orange box. The image at the top makes it larger. I think that's part of what makes it scream "advertisement!". The other thing that bothers me, is that it blends in with the main page more. The Orange, Blue and Yellow boxes have a very distinct border. This one has a thin grey border, making it seem more 'stealthy'. 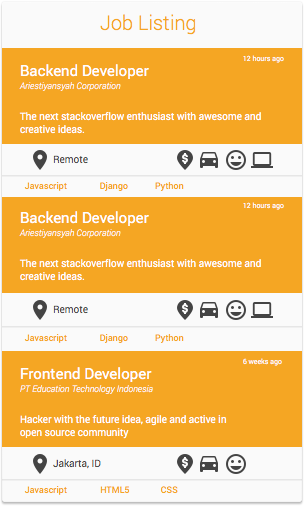 Finally, only one of these jobs is relevant (the first one), but even then with that java that I haven't answered any questions in, I don't know how relevant it actually is. It also doesn't list relocation or remote work like the other two do. I wouldn't click on it. The ability to mark a job ad as relevant or not relevant would help both sides. You'd quickly learn what I (we) like and don't like and could target jobs better. I'd get jobs that are more tuned to what I'm looking for in my next position. I do like the simple Orange/Blue/Yellow boxes. The color changes enough to draw my attention. I think the "near me" jobs need to have a bit more focus though - just because a job is near my location doesn't mean I'm interested in it. 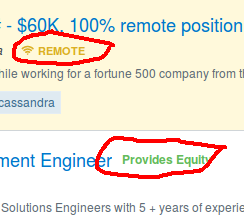 I'd be interested in something like the tag targeted yellow box, but for remote positions. Physical locality, or an interest in working in a specific field. Is the project interesting? Is it a challenge? Does it serve some kind of greater public good? Conferences, call for papers, academic research, or competitions having to do with machine learning or medical imaging. Something which turns me off about job postings is when they're canned. Of course that's out of your control, but I find my curiosity has limits, and I often won't return to looking at job listings for a few months. @blagae's comment got me thinking, what would it take to get her/his interest in a job posting? Then I realised this was a good question for me as well. So why not incorporate a survey for users in the job section? What would it take for you to consider accepting a job with us? I am not looking for a job. I might interact with ads if I knew that that I was adding to the possibility of ads being relevant when I need them. So, just a simple up/down vote and a way for me to set up my own filter would be nice. For me personally, if I didn't know that it was remote, there would be no chance I would care about it -- so it would be nice to be able to say that. First of all, I like the current overall appearance. It's distinct enough to be noticeable, obviously not part of the content I'm reading or replying to, and not flashy enough to be distracting. Second, I like having multiple suggestions. job title. I wish there was a way to get more precision on this! location. And relocation avail. And visa sponsorship avail. contract vs permanent. Some of us won't touch contract; others won't touch permanent. I'm presuming there's no room for job descriptions, though if they appeared in a pop-up when I hover a mouse over it, I would kind of like that. Teasers that consistently waste my time get ignored. It'd be nice if there was a way for companies to clarify if they are in a "we want smart people who can code, but not necessarily require experience in the language(s) we use." The only way to find out is to click through and try to read/parse HR-speak job postings. I think more important than "how to show the ad", is to filter what ad to show. E.g. 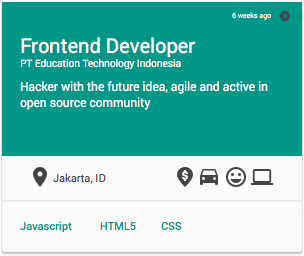 I often see job ads for frontend developers, but my CV says that I dislike frontend. How about showing something like a scoring about how good the job matches the users CV. This does not have to be a number. It could be a bronce, silver or gold badge. Another thing to add: the jobs displayed need to not show positions which are tagged in technologies you hate on your job profile. There are some technologies that I wouldn't touch for 2x the pay, and I've added those to the job seeker profile - honor that & you'd go a long way towards making things more useful. In addition, it would be nice to let us tell you our geographic preferences in the job seeker profiles, and filter the results by that. For example, I'm nowhere near Seattle, but I'd not be averse to relocating. So, since you know where I live, if I've ticked the box that says "willing to relocate" you should show me positions in Seattle. There's noplace to tell you that on the job seeker profile, however. First of all I want to mark jobs as "Not interesting / hide forever / ignore" which i don't want to see. I'm seeing over and over again same rubbish company ads or some jobs which is not interested with me. For example, I went to one of that companies for interview already -not on SO- and I don't want to see that job, even if I quickly ignore after I saw. It's still engaging my attention, I'm losing my time (yes seconds, stones become mountains). Disappointment is cherry on top. What about showing job offers regardless of the location? 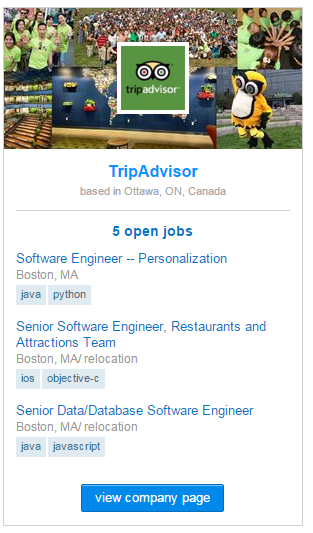 I get all my job adds from around my are, and the only data I have filled in my StackOverflow CV is that I am not looking for a job and that I don't mind to relocate. I don't mind to relocate == I don't mind job offers in Hong Kong or New York, as long as they are what I like. However, I'm stuck with Exeter job ads, because I live nearby! I'd like to see the Joel test results. I'm working in a Joel rating 5 environment - and do not want to make this experience again. Don't show anything, only to show anything. Treat it more responsibly, by helping both sides (user and advertiser) to come together. There is no other benefit for all involved parties by displaying ads. Focus more on UX-Design. The design (colors, forms etc.) is the result of UX-Design. If NO: Don't bother him with these kind of advertisement. Really, don't bother him. Store his answers in a cookie and read it each time he visits stackoverflow. This could be enough to give a idea of it. @JustGoscha Thank you for your feedback regarding googlemaps. Googlemaps makes only sense and is only a solution, if the user wants localized ads. Add little numbers to see under the ad: how many unique users clicked the add, how many applied, how many got response from the company. More of a re-design to @Ritzgy's answer. Instead of having the date both up top and below, I replaced the one below with symbols signifying - wait, can't you tell what they mean? ...And add different icons based on different criteria. In the side bar, I'd like to be able to click an "X" to make certain ads go away. On the job detail page I'd like to be able to upvote, downvote, ask questions, and comment on ads. (but, to be honest, we mainly use Java). 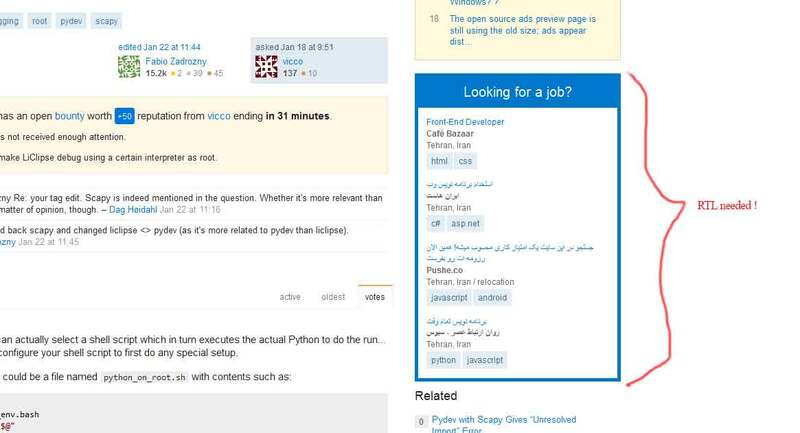 This wastes my time because they tagged it with python even though they are a Java shop. I don't like the link More jobs near city-name because it force me to change page and it is the only way to see the complete list of job positions. I think that the box should work as a slideshow. Following this approach I could search all job descriptions using, for example, two arrow buttons. The link More jobs near city-name could be replaced with something like Search your job. Not the answer you're looking for? Browse other questions tagged discussion jobs advertising . 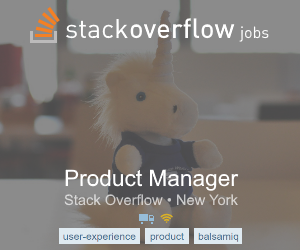 How can Stack Overflow be successfully and effectively used for job search?